Time and again, Orchestrator Runbook authors want to copy a runbook from one folder to another for a variety of reasons. The reasons could be folder hierarchy reorganization, want to use the same runbook functionality and add newer functionality but do not want to change the existing runbook- may be getting used already in other runbooks etc..
Orchestrator runbook designer does not have any feature out of the box to copy a runbook from one folder to another. 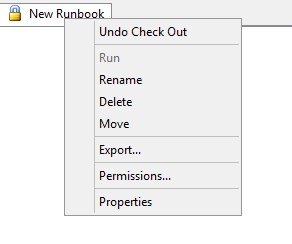 If you right click on a runbook the following options are presented. Quite visible that the “Copy” option is not available. There are options to select the activities from within source runbook, copy them and then paste them on target runbook. This however, do not copy the runbook settings and configuration to the target runbook. The author still needs to manually update the target runbook with these settings and configuration. An easy out-of-box way to copy runbook from one folder to another is available in Orchestrator however in a disguised manner. There is a great feature called Export and Import runbooks that can be used to copy a runbook. Simply, export the source runbook and after exporting, import it to the target folder. Hope you would find this tip helpful..